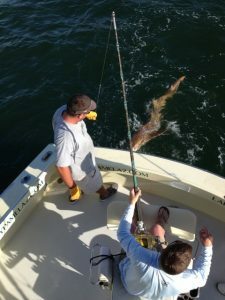 While fishing off Fort Lauderdale has improved, especially in the reef area, landing a complete fish has gotten harder. Kingfish and Bonitos are plentiful this time of year and following them are some of the largest sharks we catch all season. It’s fun for me as a rod bends over and one of our guests asks “What do you think I’ve got on”? “An improperly rigged shark bait” is my favorite answer. The fact is a fish struggling on the line sends out the kind of distress signals and vibrations that attract sharks attention. It’s almost like ringing the dinner bell. And even a small King or Bonito will pull much harder when being chased by who knows what? I do know landing fish missing tails or half their body is more frequent this time of year. And if you’re looking to wrestle something big on rod and reel? You’ve come to the right place. Hammerhead, Dusky, Tiger, Thresher, Bull, Sandbar and even Mako Sharks are all present and accounted for. We’ve been catching them on a regular basis. Even the smaller sharks we may catch can be in danger of being bitten by a larger one. It’s a dog eat dog world and the dogs are hungry! Fishing for shark isn’t very glamour or exciting, well, not until that 130 International reel begins peeling line off and the big rod is bent almost touching the water. Just getting the rod out of the holder and into the chair is a struggle, the safety lines are clipped to the eyelets on the top of the reel and all you can do is hang on. And even though we mention that when the line stops going out it’s time for you to reel, many don’t as they sit in awe and feel the power of this animal pulling line like it is nothing. As other chip in and help clearing the other lines from the water, the mate begins with instructions if you need them. Lift the rod slowly if the fish has stopped and then wind as you lower it. It seems kind of futile as you gain a couple of feet or so and the fish just took out 100 yards or better in less than a minute. Once the fish is turned toward you thing get a bit easier. But that direction can change in a heartbeat and you’re losing line once again. Or you can have what Justin and I had the other day, the fish basically swam right to the boat! The angler had trouble reeling fast enough to take up the slack line. That all changed when that Hammerhead saw the boat and turned the other way. The fight could last minutes or hours, generally somewhere between 30 and 60 minutes. But all that time is forgotten when the fish finally appears from the depth and you get your first look at it. The pictures I chose were of an 8’ Nurse Shark we caught fishing in the I.C.W. while fishing inshore. 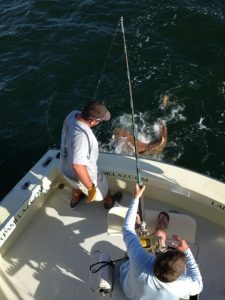 While Nurse Sharks are not considered dangerous as most the sharks we catch are, I got a couple of good shots from the flybridge of this fish being brought up to the boat. The sharks we catch in the ocean aren’t quite so cooperative. I hope the pictures give you an idea of what I get to see each and every day… My guests, happy to be reeling in the big ones. BTW… They get bigger in the ocean… Lots bigger. Calm seas, light winds, sunny skies and some great fishing… Does this sound good to you? Well, this is what we’ve had for the last week or so here in Fort Lauderdale. Our guests are having a blast catching all kinds of fish in near perfect south Florida weather, the kind they advertise in the brochures, the kind that make you jealous when the temps are freezing. And we expect this kind of thing to continue and even improve. May is usually an exceptional month for fishing here in Fort Lauderdale. Big Mahi’s are already being caught, slightly ahead of schedule. Small ones too are making their appearance and we expect more to come. Tuna fishing is down right now Wahoo fishing is getting stronger. With some Bonitos already coming through, summer fishing has begun. One fish it is very nice to see return is the King Mackerel or Kingfish the largest of the mackerel family. This was always a staple in fishing here and for the last 1.5 years has been very slow. And we did a little fishing for Kings today with our group. Karina, Chris, Ian and Mark joined us for the day. Loaded with a bunch of food and beer, we headed out in winds so light, no kite could be flown. Catching some live Ballyhoo was our thought because Sailfish and Dolphin LOVE live Hoos. But the light winds and little current made things difficult. We still had a blast catching the ones we did. Chris and Mark actually got quite good at it. We started trolling and caught a few Kings, nice sized ones at that. Chris and Karina both love to cook and were discussing how to prepare the fish when the highline sang out. Something big had grabbed our bait and was making a long run with it. Karina was up and got the call to the chair where for over 20 minutes she battled the unknown. Rod bent, she did a great job staying tight with the fish until he finally appeared. The Kingfish in the picture with Karina and mate Adam was what she had landed. Over 40 lbs., quite a catch on light tackle and even more amazing to land whole, what with all the sharks that have been present. Speaking of sharks, we did a little of that kind of fishing after landing this fish since our edible quota had now been met. Some live Hoos out and a few shark baits. Fishing for sharks can take an hour or two but we only waited about 30 minutes before the rod bent and we were connected to something large. Ian was called to be our angler on this one. This took about 40 minutes to land, a just under 7’ Bull shark. Bull sharks are notorious for bad dispositions and this one was mad. Adam pulled the leader to the boat numerous times and the fish just wouldn’t quit. We finally got him close enough to measure and retrieve our hooks before releasing him back to the sea. Some trolling home for Mahi-Mahi or Tuna but we struck out on that today. Still all in all, it was a great day and our crew was out of beer. Time to head home and restock. Great weather AND fishing are here right now. Why aren’t you in Fort Lauderdale? I usually write about one trip with how it happened but this week has been so good it’s hard to pick just one. We’ve had a great week catching fish of all sorts from small to large. Let me give you a rundown of what’s been going on. The troll has been very productive. Blackfin Tuna up to 12 lbs. or so on the troll with bigger Tuna being caught on live bait. Small to medium sized Mahi-Mahi’s have also been around with a few bruisers mixed in for good measure. Bonitos and King Mackerel have been biting well on the reef area with an occasional shot at a Sailfish. All our trips have been catching great fish! But wait, there’s more! Switching to live bait has also been very good. Sailfish, the larger Tuna and Mahi’s have been eating us up. Shark fishing right now is off the scale. It’s springtime and these fish are migrating and hungry. Finding something big these days is not hard. One afternoon trip this week had Elisha, his 2 brothers and dad Joe. His dream fish was to catch a Dolphin( Mahi-Mahi). As I said, there have been some around so off we went just a few miles from shore and found a Magnificent Frigate bird flying over an area. A quick turn toward the bird and we were hooked up in no time. Elisha got his dream fish along with 4 or 5 others. But his surprise was not quite over. We had caught 9 or 10 Mahi’s and had to toss some back because they were too small. Larger fish had been hitting the live baits so we opted to put the kites up. 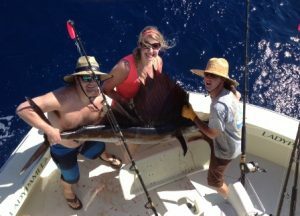 Elisha was back in the chair when a 90+” Sailfish came to play. The Dolphin was his dream fish but he sure had his hands full fighting that Sail. It took him over 45 minutes to get it to the side of the boat where they got some pictures of the fish but I did not. 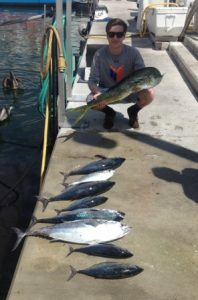 Not bad for a young boy catching his first Mahi AND first Sail on the same trip! I know everyone up north is happy to see winter end. With the way the fishing has been here in Fort Lauderdale? So are we! Fishing in Fort Lauderdale is on the upswing, as it usually is this time of year. April is a kind of starting point where our springtime fishing increases the number of fish and species we catch. Those winter months are usually Sailfish season and even though those up north had extreme winter conditions, we down here in the south experienced and unusually mild winter. With the water never reaching its lowest temperature, the fish had no reason to migrate. But they will, and soon! We’ve seen this before, most recently just a few years ago. April came after a slow billfish season and in mid-April, we were having some of the best billfish fishing we had seen in a few years. Sailfish were migrating both directions at the same time. But it’s not just about billfish, there’s more. We’ve already seen increases in King Mackerel, Bonito and Tuna. Mahi-Mahi have also been around though not abundant yet, that is yet to come. And with the Kings and Bonitos around? Here come the sharks as well. April is the time of year we catch most of our biggest sharks as they breed and feed through our waters. I should mention that almost ALL sharks we encounter are protected and released. Only the short finned Mako shark is kept and they are very rare to catch. With the abundance of fish on the troll, we haven’t been Snapper fishing much but April is a good time for that as well. We’ll also be looking forward to grouper season opening back up May 1st. Our trip just yesterday with Tim and his boys, Matt, Brian and Tim, netted us 12 Bonitos, 3 nice sized Blackfin Tuna and we released 2 Sailfish. We got both Sailfish to the boat but elected to leave them in the water instead of boating them for pictures, less stress on the fish. Our release flags that the boys are holding will have to do. All in all, a fun trip! It all starts in April, right now as a matter of fact. Fishing is improving and it’s going to get better in Fort Lauderdale. We’re ready and waiting. See you soon. Most fishing trips that have family and friends involve the hope of catching some fish to eat. Dave, his daughter Betsy or Boo as he called her and the rest of the group were looking to barbecue something later that day. Most on board had done some fishing here and as we talked trying to decide on a plan of action, I had mentioned live bait. There have been a few Sailfish around and most the decent Dolphin (Mahi-Mahi) we’ve been catching had been on livies… A Sail would be cool so we ordered a ½ dozen live baits. With the kites back up and loaded, our next bite was Betsy’s turn, everyone but Dave had caught a fish. And here comes Mr. Sailfish! Textbook bite and the game was on with Boo hearing everyone tell her how to fight this Sail, her first. There is one great thing about women anglers, they listen and do what they’re told. They don’t try to overpower the fish, they use finesse and let the rod and reel do their work. It took all of about 20 minutes or so to get the fish at the side of the boat and Justin reached over, grabbed him by the bill and brought him in for pictures. I mean who wouldn’t enjoy seeing a pretty blonde next to her first sailfish? Everyone was delighted as we headed home and when our guests are happy? So are we! There are fishing trips here in Fort Lauderdale that start with bites as soon as you wet a line. Right out of the port, fish can be abundant right by the entrance of Port Everglades. Then there are those trips you have to search a bit to find the fish. If you’re trolling, this is rather easy as you are covering a lot of area as you move along. But today we were kite fishing with a repeat friend. Arthur and Marcelo were back with us again, local bankers that bring clients and vendors. 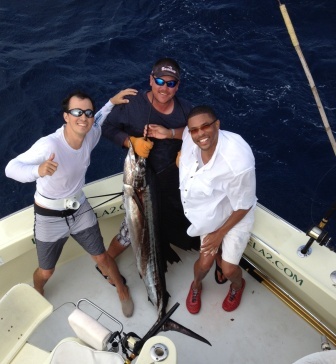 They had Zach and Peter with them, two guys that seldom get to fish, especially deep sea fishing. The kites were up and were drifted with the current to the north. Light winds allowed us to move in and out of depths and most fish that had been seen that day had been in fairly shallow waters. 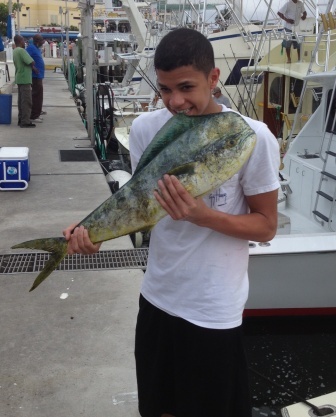 We were hoping for Mahi-Mahi, Arthur loves fresh fish and a few had been around. There were also a few sailfish as well in the same depth. But the afternoon was proving to be slower than the morning trips as we waited and only saw one small Kingfish attack our spread. I’ve always preferred, if things are going to be slow, that the excitement comes toward the end of the trip rather than the beginning. Catching a really cool fish right out of the gate and then not having action afterwards can be somewhat boring. But if you have to wait for that bite, as we did today? All that waiting goes away and the excitement is what you’re left with. And with 2 Sailfish showing up toward the end of the trip? That’s exactly what we had! When you hook 2 fish at the same time, they seldom swim together. They cross and recross the lines, which has to be orchestrated by the mate to keep things clear. These are powerful fish so they can take line from a reel in no time at all and that’s just what they did. And as one fish ran north and the other to the southeast? Chasing after them with the boat was not an option… yet. This is where patience pays off big. The fight is done by working one fish and getting some line back. Then the other fish is worked, even though you may lose a bit of line on the other. Arthur and Marcelo did excellent jobs in following instructions from Justin and within about 45 minutes, we had released Arthur’s fish and boated Marcelo’s for pictures. So that patience pays off in both waiting for the bite and winning the fight. It can’t be rushed or hurried. And what you end up with is all smiles and repeat guests. I know Arthur will be back! We have had an unusual year as far as our weather here in Fort Lauderdale. While most of you have been freezing your butts off, we have been experiencing higher than normal temperatures. The cold fronts we did have didn’t stay long and the water never got really cool enough to move the fish through. January and February were slow months for fishing but things are changing for the good. We’ve already experienced some Dolphin which is usually a spring and summer fish. But the BIG surprise is the Tunas and Bonitos are showing about 1 month early! Bonitos, a valuable bait source for us, are biting well and giving our anglers some well-deserved action. Bending the rod is always our goal and these fish sure do fit that bill. 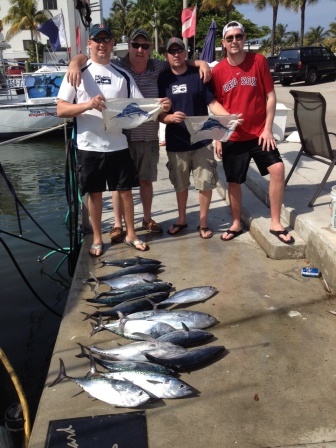 With them, some nice sized Blackfin Tunas are also in the area, again arriving earlier than normal. Our trip yesterday was quite a surprise to find us reeling more than talking. Bonitos 2 and 3 at a time, a Blackfin here and there, even a Dolphin that’s being held in the picture. And with these fish come the predators, the big Sharks! Mix this with some Sailfish action and you’ve got yourself a great trip! Fort Lauderdale fishing is lighting up. It’s time to get out there. I look forward to it every day. Fort Lauderdale’s time table for fishing has been a bit off this year. While everyone up north are freezing or shoveling, we in the south have been experiencing warmer weather than normal. The Sailfish that were due in January and February came through in a very spotty migration but things are changing as the last few days have shown and in a good way. We had Sergio, his brother Fabio, another brother and friend whose names I can’t even begin to spell, much less pronounce. LOL The chatter changed from English to Italian frequently as the visitor from Italy didn’t speak much English. It was a sunny, breeze day with east winds for some kite fishing but first a little trolling. We began trolling and our first bite came quickly right by the sea buoy, a strong hit that tore line off one of the deep rods. 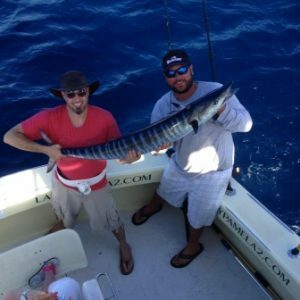 A second big run came and this kind of bite usually nets a big Wahoo or Kingfish. Well, it was a King but not a big one. As a matter of fact, it was only about an 8 pounder and just half of that when we got him to the boat. Something big had eaten half our fish. A Barracuda or maybe a shark is the most likely culprit bit we’ll never know. A few other hits and boating a King brought cheers from our group on successfully landing the entire fish. We switched to kite fishing with the purchased live bait, Fabio as an avid fisherman and Sailfish had eluded him, it was his hope and dream. It hadn’t been red hot for Sails but a few have been around. We even raised one, a window shopper, looking but not biting. He was there and gone in a flash. Mahi-mahi is the Hawaiian name for the fish Dolphin, also known as El Dorado. According to Wikipedia, Mahi-mahi means very strong which suits this fish well. Even small Dolphin can give quite a fight on hook and line. A bite came fast and furious, a Mahi had swam into our baits and eaten one… While Justin hooked that one, another ate the long bait on the side and with 2 mid-teens fish on, the fun began with our English/ Italian language barrier. Mahi’s swim and jump erratically constantly crossing the lines. You have to move around, under this rod or over to the left to keep the lines untangled. And both fish were within a few feet of each other, coming to the boat at the same time. As they approached, another follower was with them but we didn’t have time to pitch him a bait. With both fish finally boated and safely in our fishbox, that 3rd fish ate one of the remaining baits in the kite. A bit easier with just one on and we worked the fish to the boat and got him into the box as well. That’s the great thing about kite fishing, while truly the best for Sailfishing, anything can and will eat those baits. Our group was quite pleased with their bounty as our time was up and we headed home. Back at the dock we snapped pictures. Sergio had gotten over his sea sickness; he predicted he would get sick… Fabio was already making plans to return with friends this week in search of that sail he wants and us? We’ll be here, ready and waiting to go again. And looking forward to it. 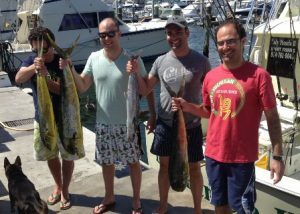 Usually when we talk about a fishing charter with kids in Fort Lauderdale, it involves a family charter where everyone is involved. Today was a bit different as we were chartered for the sole purpose of catching fish for Milo, a 4 year old from London. It was absolutely gorgeous today with clear, sunny skies, light breezes, calm seas and fairly nice temperatures in the mid 80’s. With Milo’s mom, his “special mom” as he called her and baby brother on board, we began trolling in the inlet. Spanish Mackerel have been around and the tide was just beginning to fall. Small spoons are used and they work well, our first fish was hooked less than 5 minutes after leaving the dock. 4 year olds are very curious and keeping Milo’s small hands away from the Mackerel’s mouth wasn’t easy, he wanted to touch his fish. Another fish he was unable to touch was caught, a Leather Jack. Shiny silver with a bright yellow tail, these small fish have tangs in both the lower and upper parts of their bodies. They can make a mate’s hands throb for hours if handled incorrectly and Justin chose to de-hook this one and let it go. Of course, mom got a picture. Early fall is when the baitfish move through our area and a bit further out to sea we began catching small Bullet Bonitos 2 at a time. Milo was going from one rod to the other reeling them in for us. It became humorous as he’d wind the fish in while pointing with his other hand at planes and other things that caught his attention, asking questions the whole time. Apparently these fish didn’t require his full attention. LOL And we finally had caught some fish Milo could touch and hold. He was quite excited. With plenty of live bait in our well, we headed for shallow waters in search of Barracuda, something a little more substantial for Milo to reel in. The tide had turned and the water in close was getting murky from recent rains. It took some time to finally get our bite but Milo waited patiently, unusual for a 4 year old. The line was singing out and Justin had the rod positioned sideways in the rod holder, Milo was too small to hold the rod and he fought the fish as he had all the others. It took him over 10 minutes to land this Barracuda all by himself. He was quite proud and should be, considering the fish is almost as big as he is. Another fish we kept away from Milo, Barracudas are known for their canine like teeth and can move quickly if not held tight. We still had some time left and ventured off shore a ways looking for Mahi-mahi or Tuna but struck out on that. However, we did see a few turtles and other things that brought forth a barrage of questions and before we knew it, out time was over. 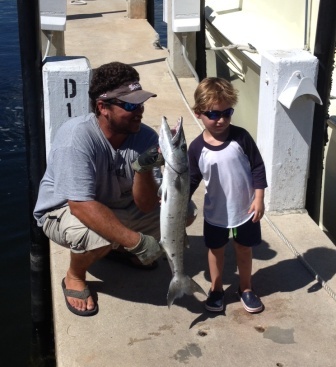 Kids, fishing charters, Fort Lauderdale… It all adds up to fun and excitement. Oh, and questions. Deep sea fishing in Fort Lauderdale this time of year is a bit different than it is in our summer months. The action is a bit slower by comparison in the winter time but, the fish we catch this time of year are usually bigger, substantially bigger. While summer months usually find us trolling the seas, winter time we switch to using live baits. And we did just this the other day with Doris and Enrique from Peru and Doris’ step grandson Jason from Georgia. Doris has done some fishing back home boasting about the White Marlin bite. We set out to catch some bait as the winds were too slight to fly the kites. Bullet Bonito were what we were after and these are excellent, active baits for just about anything. Doris and Jason were having fun catching these and a few small Tuna added to the excitement. We then set the baits out and as in all fishing, began our wait for the first bite. Slowly bumping the boat around with our baits behind us, Jason and I talked fishing on the flybridge and about patience in waiting for what is supposed to happen. Doris however, was becoming bored and wanted to go back to catching small stuff. As crew, Justin and I do not get involved in these discussions. As it was being talked about, one rod sang out, Justin set the hook and was about to hand the rod off when it went slack. The fish was gone that quick. Almost as quick as that was over, another rod sang out and this one did get hooked. Jason got the call and ended up fighting this fish in excellent form for over 20 minutes before we got a good look at what we were fighting. Once landing this 35 lbs. Wahoo, I asked Doris if she still wanted to go fish for the smaller fish. Even though we still had time, Enrique was stating they needed to get back so we headed in a bit early. It was a beautiful day in Fort Lauderdale and the fish gods had smiled upon Jason. He was still beaming at his catch. Fort Lauderdale deep sea fishing… Sometimes it’s just that one fish that makes your day.